It was one of the most boring times of a special running event. Sitting down and getting pins and needles while your bum gets sore. The only thing I enjoyed about Cross Country was finding old friends from your past schools. I sat near the room fifteen year seven boys and chatted about how we were gonna die out there. Once the year seven girls left the rest started watching videos about guys free-running for us to get pumped. Before I knew it, the year seven boys were called to go next. The call hit my ears like a hammer. That was only the beginning of my nightmare. It stung. My legs felt like they were gonna explode. They clung onto the ground like dried cement. My legs begged me to sit down and yell: "I'm gonna die!" as I walked out of the Hall. Everyone was scattered around the place. It was time to kick some syndicate arse. My legs thumped the floor in warm up. To ease the pain, I decided to think about that I was gonna win ten million dollars if I did it. That made me feel better. Then it was time to run. My feet stomped the floor each time I jogged. Passing people at all times and seeing old friends. Up hills didn't stop me from over coming the race. My laces weren't on my side at the time. 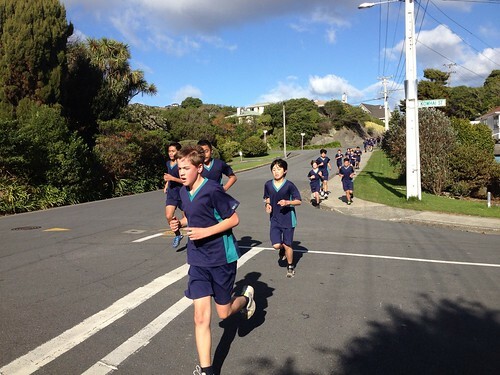 I reached the school after several agonising jogs and sprints. My friends cheering me on. I passed the yellow line, and came 103rd. Great post. I like how you immediately hooked me into your story by your introduction. You have included some fantastic descriptive detail. Perhaps you could have beefed up the running of the events by talking about about the sounds or sights of the run as well as how you were feeling. How do you think you will go in next year's Cross Country?